Marris and Clinton moved from Nigeria to Kuala Lumpur, Malaysia, to begin a new life for themselves. They were thrilled to discover Marris was pregnant. But their excitement quickly turned to fear when their daughter Christal was born. Malaysian doctors explained something was wrong. Christal was born with some of her bladder on the outside of her body. This condition, known as bladder exstrophy, is a rare congenital condition that occurs once in every 40,000-50,000 live births. It transpires when the abdominal wall fails to close during fetal development and the bladder protrudes through the gap. Unfortunately, doctors in Malaysia were unfamiliar with this condition and did not offer Marris and Clinton reassurance or assistance. Marris cared for Christal and changed her dressings frequently while she continued to look for answers. She searched online and found a support group for families with children who suffer from bladder exstrophy. Through this online site she began to make connections through e-mail and eventually reached the International Patient Office at The Hospital for Sick Children (SickKids), which then connected her with Herbie Fund. The Herbie Fund reviewed Christal’s medical case and invited her and her mother to SickKids in Toronto, Canada to get some help. Marris and Christal arrived in Toronto on April 24, 2009 and settled in with a host family. After a series of scans and x-rays at SickKids, Christal was scheduled for surgery on April 29. Generally, surgery for this particular case is done just after the child is born. If time passes, the bladder can become irritated and scar, making it difficult to perform a corrective surgery. Unfortunately, this was the case with Christal. Luckily, Urology expert Dr. Pippi Salle was able to close the abdominal wall and position the bladder in the correct spot. Christal may never have a fully functional bladder but thanks to the skilled work at SickKids she will lead a good life. Marris and Christal remain at SickKids for the time being (July 6) to ensure there are no complications from the surgery. Christal will undergo a series of ultrasounds to give specialists at SickKids a closer look at her healing process. 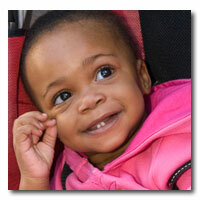 Christal, who turned one year old at SickKids in May, is a vivacious and spirited little girl. Her mother Marris cannot express her gratitude enough to the doctors and nurses who have cared for her daughter.